Sad Can’t Catch Me | Sprechen Sie Sassy? What follows is a re-post from my private blog. Now it’s out here where people can read it. 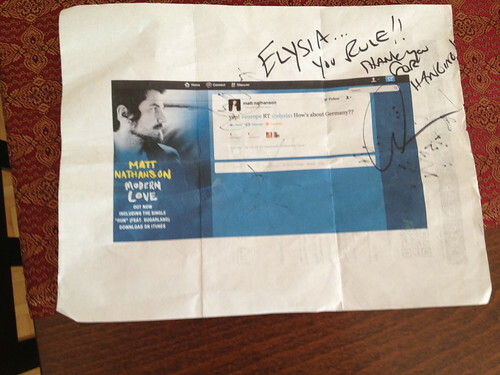 I’ve been a Matt Nathanson fan for a long time. If you’re not familiar and you have a few minutes, please watch one of these videos. For me, the album Some Mad Hope represents a specific few months just before Big D returned from Iraq. I first saw Matt in Jax Beach in 2008 – my love since then has only increased. Thanks to his mailing list, FaceBook posts and frequent tweets, I feel like we’re friends. When he Tweeted he had big tour news, I replied, he retweeted me, and I felt like a rock star myself. I was on a train headed to Paris to see Snow Patrol with Tricia when my I got an e-mail from Matt saying he’d be in Frankfurt on May 10th. And without waking Tricia up, I bought our tickets. Later, when she checked her calendar she suggested a trip to Cologne to see him the night before, giving me a second opportunity to rock (she couldn’t be here on the 10th.) And she’s the one who noticed that he was the opener on these dates… for Train. Hmmm. Fast forward to Wednesday. There were were, in a tiny, tiny Köln bar. We purposely didn’t arrive too early (thus putting us too far forward in the crowd) since I knew that he’s been heading to the merch table to meet fans after his set. So, I thought we’d enjoy the show from afar, meet, shake hands… But I blew it. After his great set that included a hilarious version of Rock You Like a Hurricane that confused the Germans (a set I could hear, but not see – seriously, this club was tiny and the crowd was huge) We headed back to the tiny merch table, Tricia asked if he was around and we found out we’d just missed him. Thank goodness I had another show the next night to get it all figured out! So Thursday in Frankfurt… Barbara and I got a sweet, sweet spot in what was a much better club. We were on a step, just behind the sound board. She asked what my plan was and I decided I’d just head out to the merch stand as soon as he was done. The show was great! Thanks to that step, I could see everything! Elle King was the opener (again) and she was really good. It felt like Matt’s set was as bit longer than the night before, but maybe that’s because I was busy trying to memorize every single thing that was happening? I am horrible at show reviews, so I’m not even going to try. But: Holy crap the man can move his hips. Little Red Corvette cover? Don’t even get me started. I headed out to the merch stand which was in a beer garden(!) and I was the only person there. I meekly approached the merch guy and said, “Hi… I think you were stuck talking to my drunk friend last night?” (since Tricia lingered a while – maybe a few minutes too long?) and he said, “Maybe….” but he didn’t really remember either of us, which I think is a good thing. I said that I am “totally not a stalker” but I thought Matt came out to meet and greet on occasion and did he think that would happen? He told me that Matt travels on his own and had to get on a train to the next show, but that I should “wait right here” for a while. Since I do not have nearly the gift of small talk that Tricia has, I offered to buy him a drink so that I could wait in the drink line a few feet away rather than just standing there being awkward. Sean (Shawn?) took me through a door, up some stairs and…. there in a tiny room with a table for four and a big fruit tray, Matt Nathanson was waiting for me. Aaron Tapp and Elle King sat at the table and Matt stood up and said, “HI!” as if we were long lost friends. I said “Hi. I bet you’re wondering who the heck I am…. I had no idea when I asked if I could speak with you that it would evolve into this. I am so sorry…” And he COULD NOT have been nicer. He asked where I’m from – I said Big D is in the Army so we’ve lived all over but we call Jacksonville Beach, Florida, home. I mentioned I’d seen him perform there at the Freebird and we both said “Live Cafe!” in unison. He asked how things really are in Afghanistan, a bit about D’s job, how often he’s away… I mentioned that I am so, so lucky to be in Europe and to be able to travel around and said I was in Amsterdam last week. We talked about Queens Day, traveling by train, and the European countryside. He told me he saw fantastic artwork in Köln but couldn’t remember the artists name, so he pulled his iPhone out to see what he had saved. He opened his Notes app and said, “Where would you save that if you were me…. all that’s here is lyrics, lyrics, lyrics…” We were standing so close that when we both looked down at his phone our foreheads bumped, and I don’t care if it confirms that I am a 12 year old fan girl at heart: I couldn’t believe it. Anyway, the artist is Kathe Kollwitz and talking about her and travel led to how much I love Berlin (he was headed there the next day) with it’s outrageous history, architecture, and artwork including large scale outdoor Keith Haring installations. After Shawn/Sean took our picture and Matt tried to get me to take an apple from the fruit tray, it was time to go. And for once in my life, I did not feel like a giant loser. I had a fantastic opportunity thanks to luck, timing, and a merch guy named Gav. And for those few minutes, everything was perfect. After my brief bit about love songs, I mentioned that Matt and I sound really good when we sing together in my car, though interestingly, I am a terrible singer and that’s when he opened his arms and we hugged like we are good friends. And I really felt like we were. There’s more to the night’s story – including Barbara and I hanging out and drinking beers in a tiny bar at 1am with the members of Train, but when it all came to a close and I walked out that bar door, I came face to face with Elle King. She was there for the whole exchange with Matt and she recognized me right away. Such a great story! 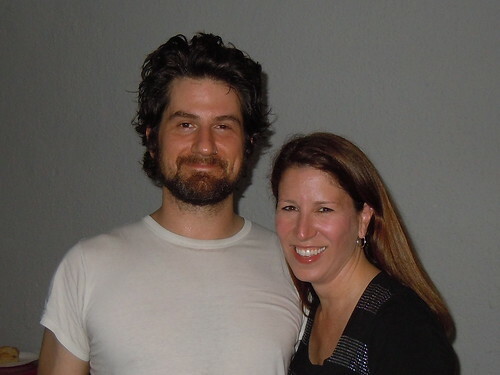 I love Matt Nathanson. Come on get higher! Ahhhhh! I love that story! Priceless! Pingback: Fall wrap-up | Sprechen Sie Sassy? Pingback: One Crazy Summer | Sprechen Sie Sassy? Pingback: Come on take my hand and we’ll go down swinging | Sprechen Sie Sassy?